Vincent Rubio and his partner, Ernie, are private eyes, working in Los Angeles. Whilst their cases are often quite similar to other PIs -- infidelity, missing persons, etc. -- they often differ in one large respect. Under their costumes, Vincent and Ernie are dinosaurs, part of a small but significant number that, now much smaller than their forebears, hide amongst the greatest threat to their survival by looking, living and acting like humans. But not all dinosaurs are happy with this arrangement. Over the preceding couple of decades a new cult, calling themselves the Progressives, has slowing grown in number, advocating that dinosaurs should shed their guises and reconnect with their true nature. The brother of Ernie’s ex-wife is a member of the cult, sinking his income and whatever else he can scrounge into their coffers. When Ernie's ex asks them to extract Rupert from their clutches and to organize getting him deprogrammed they take on the case. Their approach is to try and join the Progressives, which soon brings Vincent into contact with Circe, a femme fatale who’s intoxicating scent drives him wild. Soon, what seems like a relatively straightforward case soon takes a more sinister turn and Vincent and Ernie are deep into conspiracy territory. 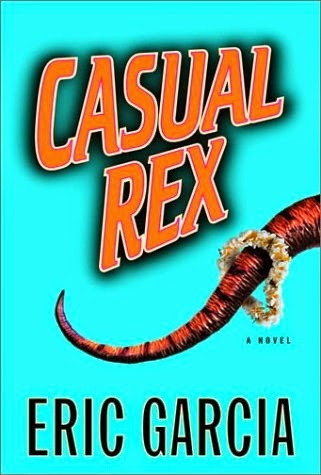 Casual Rex is a hardboiled PI tale with a twist -- the PIs are dinosaurs dressed in human costumes and they mostly deal with cases related to their brethren. Like the ancestors of humans, a handful of dinosaur species survived the major extinction event 65 million years ago that wiped most of them out. Over time they reduced in size and decided the easiest way to survive was to pass themselves off as humans, wearing realistic suits involving lots of straps and buckles. It’s a premise that kind of works as long as you don’t press on it all -- a whole series of logical questions would quickly bring the whole edifice down. The way Garcia keeps the illusion intact is to play the story pretty much straight-up, at least for the first half of the tale. Vincent and Ernie are two LA PIs, acting like fictional LA PIs alia dozens of such Chandler-inspired tales, albeit their clients tend to be other disguised dinosaurs. By centring the case around a cult, the Progressives, that advocate that dinosaurs shed their human guises, Garcia allows the premise to be explored a bit, though he still plays it quite straight. Indeed, the story is more quirky than funny, with the humour element quite underplayed until near the end and the final showdown. It took me some time to get in fully vested in the story, and it is only once it shifts to location to Hawaii that it really finds its groove. Overall, an interesting and entertaining tale that gets better as it progresses.